How adorable are these new Sephora Flash Sequin Miniature Palettes? 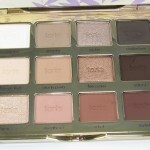 These eyeshadow palettes contain six shades each and are available in peach and purple shade selections. Best part? They are $10 bucks each! Can’t beat it! I don’t really judge Sephora’s cheap palettes until I tried ’em! I remember the Delicate Eyeshadow Palette shocked the hell out of me! It was just so good! I actually hit pan on a lot of the shades in that palette! Look using it below! See? Totally brilliant! The Peach Gold Flash Sequin Miniature Palette might be coming home with me! Sephora Flash Sequin Miniature Palettes are available now! Oh mah GAHD, you look gorgeous in these pics! Those colors were made for you! aw thanks Cindy 🙂 <3! Girl I am loving the hell out of that smokey brown eye look on you!! You look stunning with that dark lip! I have the peach one in my cart along with the Farsali Liquid Glass Radiance Serum, Drunk Elephant Slaai Cleanser, the Buxom Serial kisser plumping lip stain Sephora’s new Matte Perfection Blush duos in 3 shades, Natasha Denona’s new mini bronzer/highlighter and that Nudestix kit. I know you have the Drunk Elephant cleanser and are testing it but have you purchased any of the other items I listed? Would love to hear your thoughts. Lord knows I need none of this. And this is my pared down highly edited list. Lol. aw thank you dear! I wonder how that Liquid Glass serum is curious minds! Haven’t tried any of them yet!!!!!! Def want the Nudestix set! Did you see my ND glow palette review?! That I have tried and LOVEEEEEEEEEEE! I did see your review and it was the gentle push I needed to finalize my decision to get my own a few weeks ago. Lol. It’s just gorgeous. Was my first ND blush purchase actually and I love! So thank you. You look stunning in this dark makeup look !! Love the look you created! I love the dark red lip too. What is it?! aw thank you dear you’re too kind! I generally love those Sephora mini palettes. I know some of their big numbers have been so-so, but I purchased the ‘It’ palette in neutrals, I think it was the companion palette to the Delicates that you purchased Muse, and I was blown away about how good it was. I have hit pan on a number of those beautiful taupe shades too. I would actually like both of these as they contain shades that I would use. By the way, what is the lipstick you are wearing Muse? It looks so beautiful on you.